You might decide to stay at Long Island City's Paper Factory Hotel because of its proximity to Manhattan, but you'll be whisked off to a whole other world once you're inside. A hidden gem tucked away in western Queens, the 100-year-old former paper mill renovated by DHD Architecture Design pays homage to its heritage using quirky old world touches remixed with a modern spin. Inhabitat recently paid this under-the-radar space a visit, and we were charmed by all of Gal Sela's thoughtful interior design choices, from a cascading tower of books to a lobby clad in recycled wood and adorned with a duo of delightful red phone booths. Flip through our photo gallery to take your own virtual tour of this inspiring study in hospitality. The Paper Factory Hotel features 122 guest rooms ranging from affordable shared bunks to luxurious private suites, each designed to give a nod to the building’s past life. Located in Long Island City just blocks away from Astoria‘s Kaufman Art’s District, the revamped 5-story structure is also a symbol of the neighborhood’s own transformation from a swath of derelict factories into a vibrant cultural destination. In fact, the hotel can be a little difficult to spot in its unlikely location right off of Northern Boulevard, but other early adopters like the trendy COFFEED cafe and the Brooklyn Grange rooftop farm are also testaments to the area’s newfound vitality. In addition to private guest rooms, the hotel offers over 15,000 square feet of creative communal areas. The interactive lobby is a visual feast curated with colorful artwork, vintage furnishings and even preserved industrial machinery. Reclaimed wood cladding and worn leather couches add warmth to the space while floors laminated with old New York City newspapers once again remind visitors about the building’s former life. Two game rooms invite guests to play ping-pong and foosball, and an in-house gym provides 24-hour access to fitness equipment. While The Paper Factory caters to out-of-town tourists, it also welcomes locals with community events and live Bossa Nova nights at its in-house restaurant, Mundo. The hotel also has plans to open a beer garden in its courtyard in the near future. The Paper Factory Hotel features 122 guest rooms ranging from affordable shared bunks to luxurious private suites, each designed to give a nod to the building's past life. Located in Long Island City just blocks away from Astoria's Kaufman Art’s District, the revamped 5-story structure is also a symbol of the neighborhood's own transformation from a swath of derelict factories into a vibrant cultural destination. In fact, the hotel can be a little difficult to spot in its unlikely location right off of Northern Boulevard, but other early adopters like the trendy COFFEED cafe and the Brooklyn Grange rooftop farm are also testaments to the area's newfound vitality. In addition to private guest rooms, the hotel offers over 15,000 square feet of creative communal areas. The interactive lobby is a visual feast curated with colorful artwork, vintage furnishings and even preserved industrial machinery. Reclaimed wood cladding and worn leather couches add warmth to the space while floors laminated with old New York City newspapers once again remind visitors about the building's former life. Two game rooms invite guests to play ping-pong and foosball. An in-house gym provides 24-hour access to fitness equipment. While The Paper Factory caters to out-of-town tourists, it also welcomes locals. The hotel hosts community events in its communal spaces. 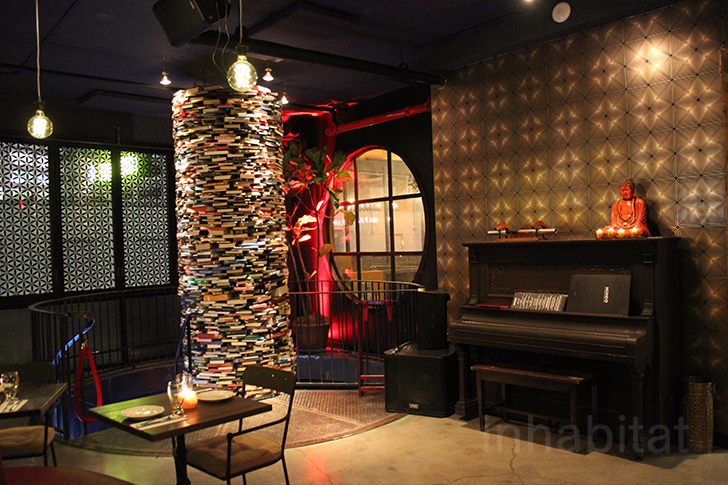 There are also live Bossa Nova nights at its in-house restaurant, Mundo. The bar at Mundo has become a meeting spot for locals as well. Lovely lamps adorn the bar area. The lower level of the restaurant is home to one of the factory's original paper machines. A closer look at that cascading book tower. A covered area off of the lobby leads out to an outdoor courtyard. The hotel also has plans to open a beer garden in its courtyard in the near future.